← Ek Nayi League, Our own Kapil Dev’s Launch – What Can IT Be? Deadly Dating Games: Murder. Blackmail. 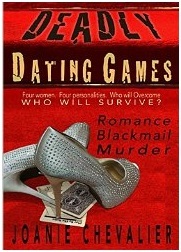 Romance by Joanie Chevalier mainly hovers around the theme of blackmail through a different approach. 4 Women, 4 different characteristics weave the story into an absorbing thriller. Julianna, after getting over a bitter divorce joins a book club online to get over her emotional turmoil. She is elated when she meets a girl, Bess and the two hit off instantly. Julianna also starts dating Aaron, a guy who saw her profile in a dating site. All things go well till the host of the book club, Traci persuades all the members to film their dates so the others could act as critics. This activity turns into blackmailing when they accidentally film an intimate scene. Traci and Alyssa, another member of the book club blackmail the guy involved and also pull in the unfortunate Julianna and Bess into this scam. This is not one off case as Traci and Alyssa find it as a lucrative way to make money and they make sure Julianna and Bess joins them. Both of them are unable to get rid of Trace and Alyssa as they are also victims of Blackmailing and they hold pictures of Bess in compromising positions. They can neither go to the police nor assist them in their treachery. Then a man gets killed. Further the story takes a lots of twists and turns, the major one being Bess accidentally seeing Aaron coming out of Traci’s house. Does the author succeed in getting Julianna and Bess out of this mess? That is for you to check out. There was couple of occasions where we felt the book could have ended. The book feels a bit longer with too many twists and turns. The book needs a good editor. We did see confusion with tenses in few places. Posted on May 6, 2015, in Book Reviews and tagged Deadly Dating Games, Joanie Chevalier. Bookmark the permalink. 2 Comments. Thanks Joanie. It is wonderful to see you here. Welcome to Chennai Focus.